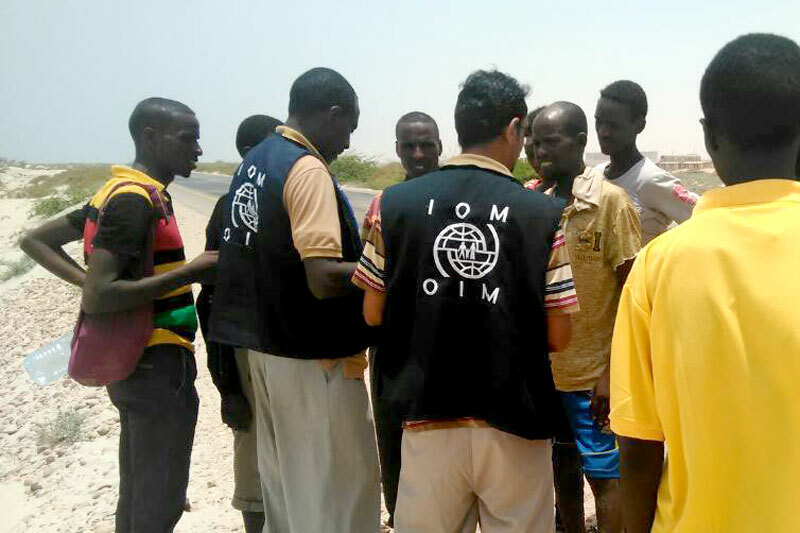 Aden – Over the past three days, staff from IOM, the UN Migration Agency, have found more survivors, as well as the remains of more victims, from last week’s tragic incidents. On 9 and 10 August, a total of 280 migrants headed towards the Gulf countries were forced from two boats off the coast of Yemen’s Shabwa Governorate. On Wednesday, 9 August, when 120 people were forced from a boat [read more here], the remains of 29 individuals (12 Ethiopian males, 12 Ethiopian females and five Somali males) were found by IOM staff on the same day. The number of people still missing has reduced from 22 to six, all of whom are Ethiopian males. Through contact or from other survivors’ reports, IOM was able to account for a majority of the missing. This makes 35 people presumed dead from the first incident. IOM provided urgent medical care, as well as food and water, to 27 survivors, 22 of whom were Ethiopian males, and the remainder, five Somali males. Eighty-five people in total survived this incident. However, many others had left the beach before IOM arrived to assist. On Thursday, 10 August, a further 160 people were forced from a second boat [read more here], again off the coast of Yemen’s Shabwa Governorate but in a different location from the first tragedy and closer to the shore. On the day of this incident, IOM found six bodies on the beach. On 11 August, IOM and local people found another four and on 12 August, another two. The current total number of confirmed dead from the second incident is 12 (eight Ethiopian males and four Ethiopian females). In the immediate aftermath of the smugglers’ actions during the second incident, 13 people were missing. Only six people remain missing and so, 18 are now presumed dead. IOM assisted 57 survivors on 10 August. Thirteen of the survivors, whom IOM had helped, returned to the beach the following day realizing that they were too weak to make the trek through the desert to Yemen’s land borders. On 13 August, IOM located five more survivors and assisted them with medical support, food and water. In total, IOM aided 65 people who survived the second incident – 62 Ethiopian males and three Ethiopian females. Some 142 people survived the second incident and, as on the previous day, people left the beach before IOM arrived. Of the 280 people forced into Yemen’s rough seas on both mornings, 226 people survived, 41 are confirmed dead and 12 are still missing. The total number of presumed dead is currently 53. The surviving Ethiopian and Somali migrants left IOM’s care and are most likely making their way to Yemen’s borders with the Gulf countries, a journey which takes a week or more depending on the route. The migration routes through Yemen are constantly changing due to the security situation in the country. IOM will continue to patrol Yemen’s beaches to provide assistance to migrants in distress and to search for the migrants still missing.